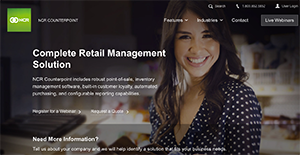 NCR CounterPoint is a retail management system that helps you manage orders, sales, returns and layaways on a single location. Its POS can be custom fit to your processes to streamline your daily operations. It is ideal for retail with up to 100 stores. The solution also has a built-in customer loyalty program, which helps you nurture repeat sales or new leads with gift registries, wish lists and gift cards, and a built-in email marketing tool. This feature enables closed-loop reporting to track purchases, target segmentation and automatic email campaigns. The POS system integrates with NCR Inventory Management, NCR Smart Alerts and NCR Secure Pay for an end-to-end retail management platform. NCR CounterPoint is an extensive POS system to help you manage and streamline your inventory processes. It also has CRM features to help you nurture customer loyalty. Managing staff is also easy with the time tracking tool. Other key features include touchscreen/manual mode, automated reporting and built-in communication. With NCR CounterPoint, users have a powerful and reliable retail POS system and inventory management software that allows them to easily handle up to 100 stores. NCR CounterPoint bridges retail businesses and customers with powerful email marketing tools. Mobile POS capabilities extend users’ reach from their stores and they can do business with customers wherever they are: events, sidewalk sales, and trade shows. E-commerce functionalities mean you can focus on important things as NCR CounterPoint automatically updates processes and process orders. Be in the loop by setting up notification alerts via text or email. With this feature, you’ll never miss important moments, in-store operations, and even potentially fraudulent situations. With NCR CounterPoint POS, running your business away from the counter is a whole lot easier. You can manage your business while helping your customers find what they are looking for and close the sale right on the spot. The mobility element also lets you reach out to customers wherever they are and complete the transaction without having to be behind the counter. Since each organization has particular business requirements, it is prudent for them to abstain from looking for a one-size-fits-all ideal software application. Needless to say, it would be useless to try to find such a platform even among market-leading software applications. The smart thing to do would be to catalog the various vital aspects that require consideration such as main features, finances, skill levels of workers, company size etc. Then, you should do your homework thoroughly. Read some NCR CounterPoint reviews and investigate each of the other systems in your shortlist in detail. Such comprehensive homework can make certain you reject ill-fitting systems and select the app that offers all the aspects you need for business success. How Much Does NCR CounterPoint Cost? NCR CounterPoint pricing is available on a by quote basis only. Contact NCR CounterPoint directly for more detailed pricing information. We realize that when you make a decision to buy POS Software it’s important not only to see how experts evaluate it in their reviews, but also to find out if the real people and companies that buy it are actually satisfied with the product. That’s why we’ve created our behavior-based Customer Satisfaction Algorithm™ that gathers customer reviews, comments and NCR CounterPoint reviews across a wide range of social media sites. The data is then presented in an easy to digest form showing how many people had positive and negative experience with NCR CounterPoint. With that information at hand you should be equipped to make an informed buying decision that you won’t regret. What are NCR CounterPoint pricing details? What integrations are available for NCR CounterPoint? If you need more information about NCR CounterPoint or you simply have a question let us know what you need and we’ll forward your request directly to the vendor.